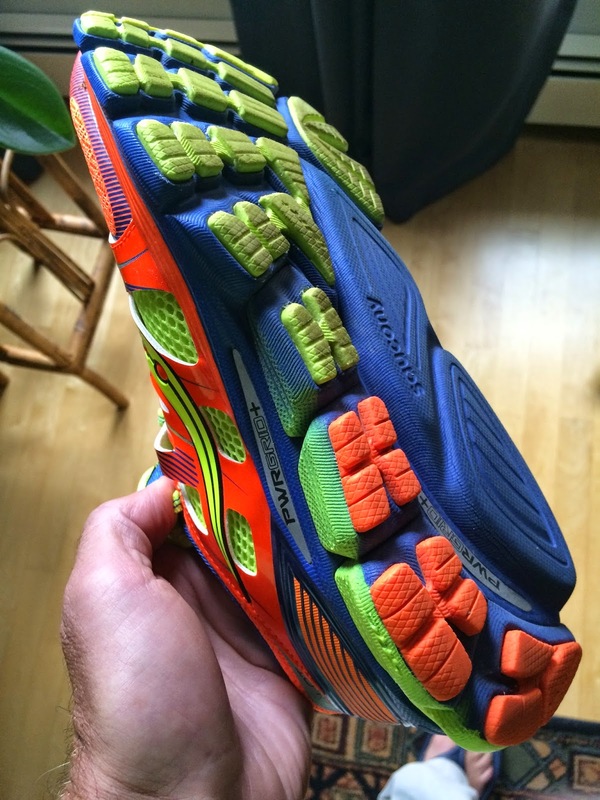 Road Trail Run: Review: Saucony Zealot-Firm where the rubber hits the road, Soft where the upper meets the foot. Review: Saucony Zealot-Firm where the rubber hits the road, Soft where the upper meets the foot. The Saucony Zealot is a 8.3 oz lightweight trainer with a stack height of 21mm in the forefoot and 25mm in the heel. The forefoot stack height puts it in the more cushioned, not quite maximal category. It features Saucony's innovative ISOFIT upper, a sock, bootie like soft mid foot upper material with the foot supported by foam bands tied into the laces and at the midsole, but with the bootie only partially attached to the sides of the upper. The "numbers" of stack height don't tell the whole tale of the Zealot. One would think with a 21/25mm stack height and relatively soft blue midsole as measured by my durometer (a device to measure foam firmness) that the Zealot would be a softish shoe, a bit firmer than Kinvara, Hoka Clifton or adidas Energy Boost. It is definitely something different. The heel is quite firm despite the cushioning as the outer rubber orange pods are very thick and firm, among if not, the firmest and thickest outsole material I have measured to date. The forefoot has slightly softer outsole lime green rubber but it too is quite firm, thick and covers much of the surface in pods. Outsoles can definitely change the ride. Needless to say all this hard rubber will give tremendous wear and I have almost no wear visible on the heel pods after 35 miles in the areas I usually wear extremely rapidly in other shoes. The deep forefoot grooves make the Zealot plenty flexible. The ISOFIT upper, also featured on the new Triumph and Hurricane and previewed at OR here is by and large fantastic. The innovation came from Saucony's track spikes. The mid foot upper (yellow) from first to last lace is made of a very stretchy super soft mesh, truly sock like. The upper meets the tongue at the edges of the laces tied together into an excellent, thin, soft tongue. No tongue slippage is possible. The foot is held securely by 4 foam bands tied to the laces with only the first lace band and top half of the last band near the toe attached to the upper towards the top of the foot. This means there is complete freedom for the foot to bend and expand during the gait yet with adequate support. The toe box is made of a less stretchy and a more dense thinner mesh but still very soft. The toe box is essentially unstructured with the overlays also very flexible. The foot has full room to splay. I notice a bit of slipping forward towards the front of the shoe so potentially a bit more structure to the toe box might be called for. I have a narrower foot but believe overall the Zealot and ISOFIT will fit many different foot shapes well. If you like a very firm yet still well cushioned heel the Zealot is for you. 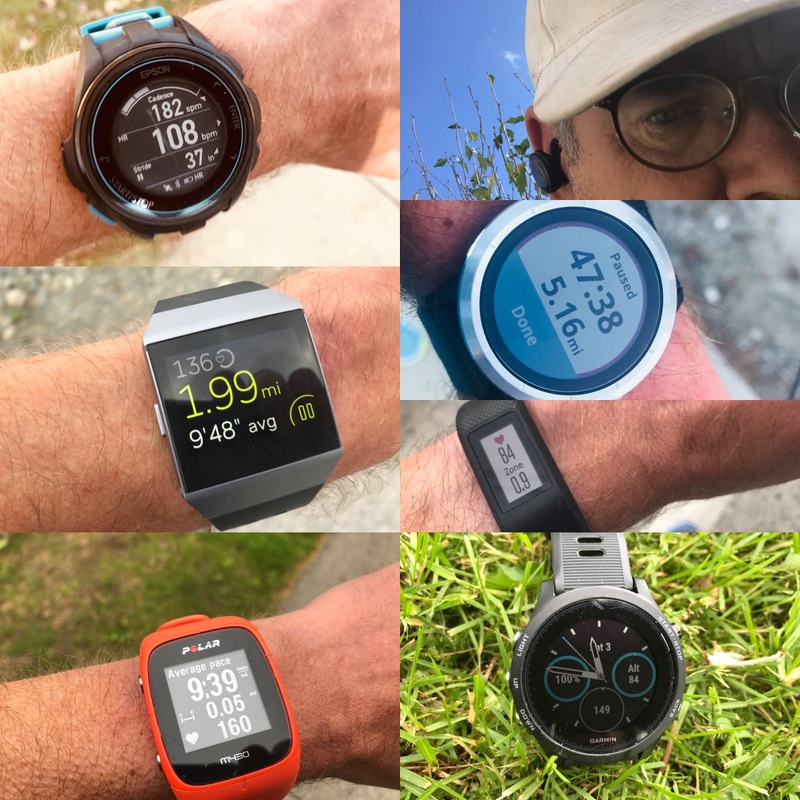 At slower speeds and heel striking, a lot of my day to day running, the Zealot is not much fun or very comfortable and smooth for me. The ISOFIT Triumph would be more my style for a trainer. As speed increases Zealot shines. This is a shoe that calls for an efficient quick stride with focus on rapidly getting to toe off leveraging the SRC (Super Rebound Compound) Impact Zone of the midsole through the mid foot. Efficient, fast, sub 8:30/min mile training pace and mid foot runners will like this shoe as a everyday light trainer and marathon shoe. So for me not a day in day out slower pace trainer but a tempo or 10K race shoe. Unlike for example, the adios Boost, Energy Boost, the firm new Pearl Izumi N2 Road V2 or the Hoka Huaka this shoe is not particularly "forgiving" and will remind you to move along! I expect long term outsole wear to be outstanding. The ISOFIT upper is a comfort and fitting innovation. Available February 2015. $130 MSRP. Derek Oxley over at Run4Lfye reviewed the Zealot here. He thought they had"... a light feeling and is the quintessential oxymoron with a unique combination of cushioned firmness. 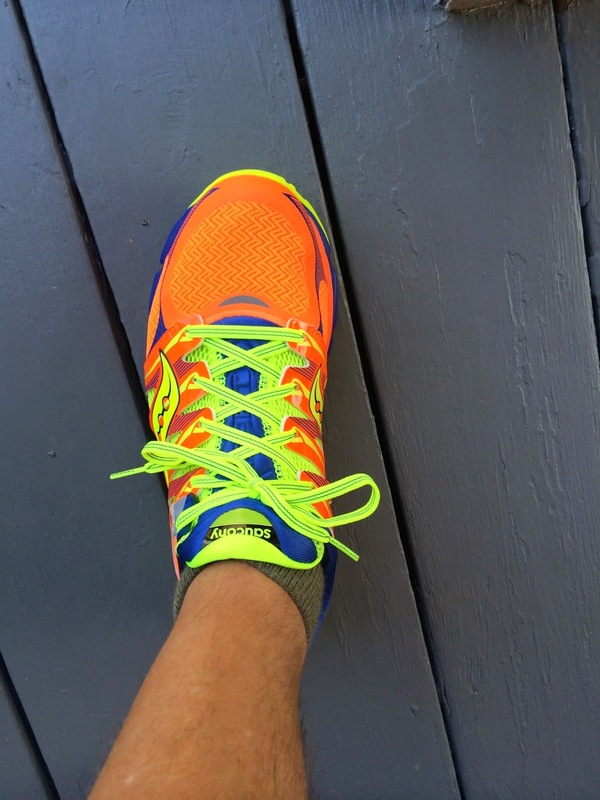 I enjoyed the flexible feeling in the forefoot." He preferred the fit of the ISO upper on the Triumph. The Zealot was provided to me at no charge for review purposes. The opinions herein are entirely my own. Purchase your Zealot ISO at the links below. They are available from Running Warehouse: Men's here, Women's here. 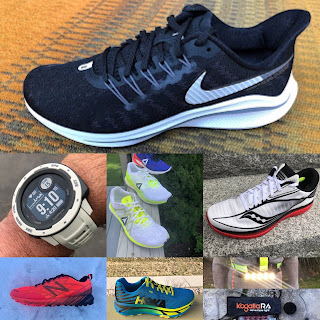 All your purchases at Running Warehouse via these links support my blog. It works well for me. Like a firmer Skechers GRR, more comfortable in the forefoot than Boracay, lighter. 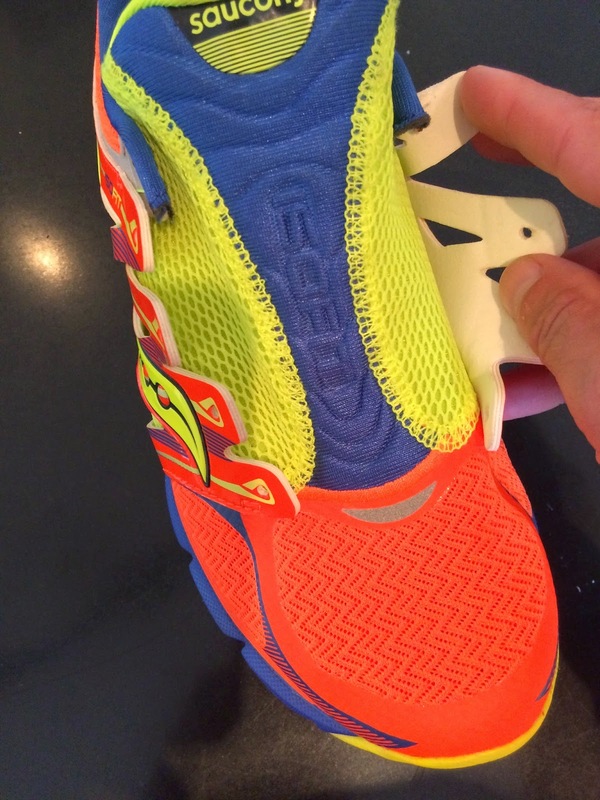 The right drop, no annoying midfoot band like the Kinvara and a little more structure.